A dental nurse’s responsibilities are complex and we thought you might like to know what their day involves. Our day starts with making tea, most importantly caffeine fuels a nurse. We then start setting up our surgeries obviously washing our hands first using the correct hand washing techniques which are displayed around the practice. We start by turning on all the equipment and making sure it’s in full working order. The dental chair water lines are then flushed through with purified and treated water. We then make sure our instruments are put into the correct places ready for the day ahead, instruments are separated to the dentists side and the nurses side – this is more important than it sounds. While setting up we also collect dentures, crowns and any other lab work ready for the day and we also check the list of patients and treatment planned for the day. To finish setting up we get the dentists, patients and our own person protective equipment out ready for use – safety first! When a patient arrives to reception we are notified in surgery via a stick man on the computer, we then call the patient through to the surgery and we try to make them feel comfortable and at ease. When the patient is settled in we check the medical histories to make sure we know of any medical problems or any medicines the patient might be taking. After this we are ready for the dentists examination. 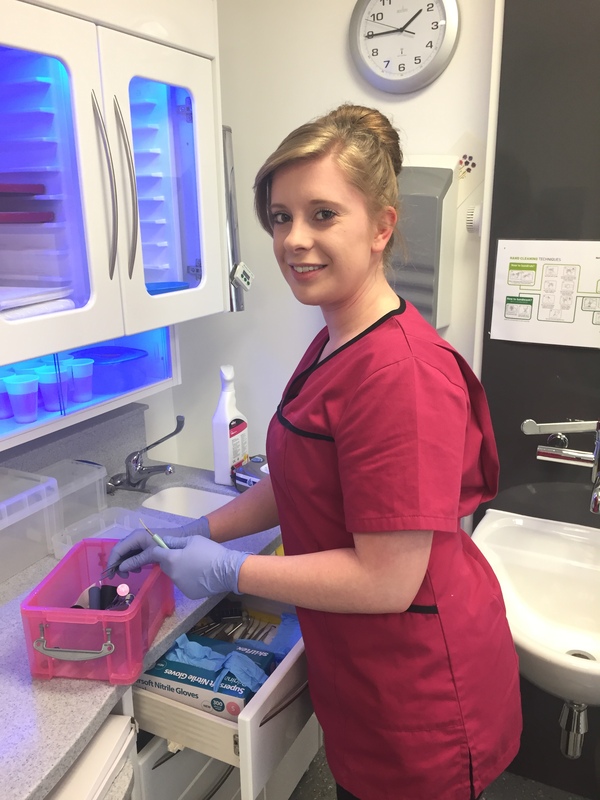 During the day one nurse is constantly with the dentist and a nurse will be in our decontamination room ensuring that the cleaning and sterilising of the instruments are being kept to the best standard. Sterilised instruments have to be sealed in special pouches and stored away when not needed. We take our used instruments to the decontamination room 3 times in the morning and 3 times in the afternoon in clear boxes which we call ‘dirty boxes’ – more can be read about our decontamination room on our previous blog ‘behind the scenes of the decontamination room’. Between patients we clean and disinfect all work surfaces and the chair. The smooth running of the practice has a lot of work behind the scenes. We try to keep on time as much as we can but sometimes things don’t always run on time as patients can be held up in traffic, procedures take longer than anticipated, or even patients come in with a different problem to the treatment that had been set up for. Every day we also allocate emergency slots throughout the day, patients are our number one priority and if someone comes down with toothache we try to see them on the day – this can also mean double booking patients which puts a lot of stress on the dentist and dental nurse to try and see patients as soon as possible. Another role of the dental nurse is to ensure the surgery has enough stock so stocking up daily is one of our tasks. Along with keeping the surgery clean and tidy if there’s no stock in your room fillings might not be able to be done, much to the delight of some patients who don’t like having fillings done. At the end of a working day we all work as a great team and rally around helping other nurses shut down their surgery, this includes flushing the water lines on the dental chair and flushing the aspirator lines with disinfectant, also wiping literally everything in sight with disinfectant wipes to make sure the surgery is clean and for the next person to use.